"Paramount Pictures and Marvel Entertainment present the highly anticipated sequel to the blockbuster film based on the legendary Marvel Super Hero "Iron Man", reuniting director Jon Favreau and Oscar nominee Robert Downey Jr. In "Iron Man 2", the world is aware that billionaire inventor Tony Stark (Robert Downey Jr.) is the armored Super Hero Iron Man. Under pressure from the government, the press and the public to share his technology with the military, Tony is unwilling to divulge the secrets behind the Iron Man armor because he fears the information will slip into the wrong hands. With Pepper Potts (Gwyneth Paltrow), and James “Rhodey” Rhodes (Don Cheadle) at his side, Tony forges new alliances and confronts powerful new forces." Here's the plot of the trailer as far as we can figure out. Tony Stark, played by Robert Downey Jr., is under pressure to share his Iron Man technology with the U.S. government. A Russian, played by Mickey Rourke, with electric whips that cut cars in half, is out for vengeance on Stark for his past developing weapons. 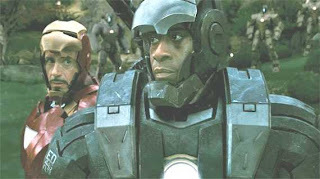 Don Cheadle, as the armored hero "War Machine", fights giant robots with "Iron Man". Scarlett Johansson, as Black Widow, is in the film beating guys up in a black skin-tight outfit. There is already a shot-by-shot analysis of the trailer, and a million blog posts about it, so I won't bother to try to compete with that. However, I'll point out three surprises: One, Whiplash actually looks cool and dangerous. Two...Garry Shandling? Three,"War Machine" looks like one bad mother-hush-yo-mouth! UPDATE: After watching the trailer a few times I had some more thoughts. I have not yet watched a single trailer of this movie.But now its getting very impatient to wait for its release through world wide. @09smithjame Check the trailer out. Right now. It's worth watching if for nothing else than to see "Whiplash". We'd love to hear what you think of it. Thanks for joining the conversation!